Today, the FCC ignored tens of millions of Americans' views, as well as comments from the world's leading internet scientists and the inventors of the internet, and give a huge regulatory gift to the telcoms sector it is supposed to be regulating, rolling back Net Neutrality and allowing those companies to extort blackmail money from the web publishers you try to access through their lines. The FCC's Net Neutrality order is so grossly overreaching that it will open the door to many legal challenges, all of which are likely to be tried out within hours of the vote. First, public interest groups will sue over the lack of evidence in support of the FCC's order. Expert agencies are required to act on evidence: when the FCC brought down Net Neutrality rules in 2015, it did so on the basis of broad hearings and studies and a long-running comment period that established the need for the order. Trump's FCC proposes to roll back all Net Neutrality rules to pre-2005 levels, something it can only do by ignoring all the evidence, comments and expert testimony, which will not sit well with the courts. States are likely to enact their own Net Neutrality rules, which the FCC's order forbids. These states will likely sue to prevent the FCC from telling them how to run their own network policy. This is a dangerous precedent, though, since a future FCC that restores Net Neutrality might find states using the same principle to opt themselves out of the rule. Congress is already being lobbied heavily to intervene and force the FCC to enact Net Neutrality rules, and there's a strong likelihood that 2018 will see a swell of new Democratic lawmakers in the House who may be able to make this happen. 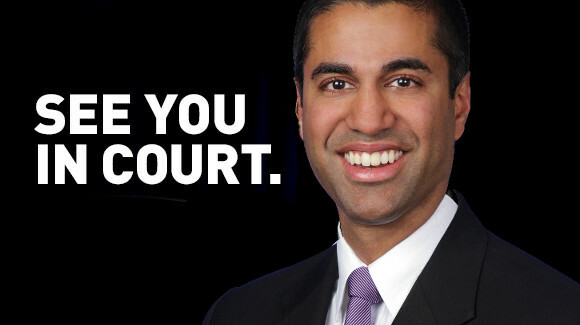 Even if we save Net Neutrality, we're still fucked for so long as Ajit Pai is in charge of enforcing it, of course.